Denny Hamlin became the first NASCAR Sprint Cup Series driver to record four wins this season and the first to score back-to-back victories after beating the field to the finish line in Sunday’s ‘green-white-checkered’ shootout at Atlanta Motor Speedway, and clinching a berth in the 2012 Chase for the championship in the process. The #11 pit crew got Hamlin out in front of the field after the race’s final caution period, and the 31-year-old driver outdueled four-time champion Jeff Gordon to the checkered flag. Hamlin had the dominant car at times throughout the 327-lap race on the 1.5-mile Georgia oval, leading seven times for a race-high 105 laps from his seventh-place starting position. However, Hamlin was running third to Martin Truex Jr. and Gordon as the laps dwindled, but found new life with a caution five laps from the scheduled distance. With everyone taking four tires, Hamlin won the race off pit road and the two-lap dash to score his 21st career Cup victory. The win moved Hamlin up one to seventh in the standings, but more importantly, the fourth victory and Chase berth means the #11 FedEx team will start with at least a tie for the points lead when the playoffs begin at Chicagoland Speedway on Sept. 16. Already the hottest driver on the circuit, the Series now heads to Hamlin’s home track of Richmond International Speedway for Saturday night’s 400-mile event on the three-quarter-mile oval. Hamlin, from nearby Chesterfield, Va., has won two of the last three fall races at Richmond and finished fourth at the track in April. Hamlin owns seven top-five finishes in 13 Richmond starts, and has finished outside the top-10 only once (11th in May 2010) at the track since Sept. 2009. Hamlin heads to the final regular season race already locked into the 2012 Chase, his seventh-straight playoff appearance. Only Hamlin and five-time champion Jimmie Johnson have made the Chase each year since Hamlin’s 2006 rookie campaign. 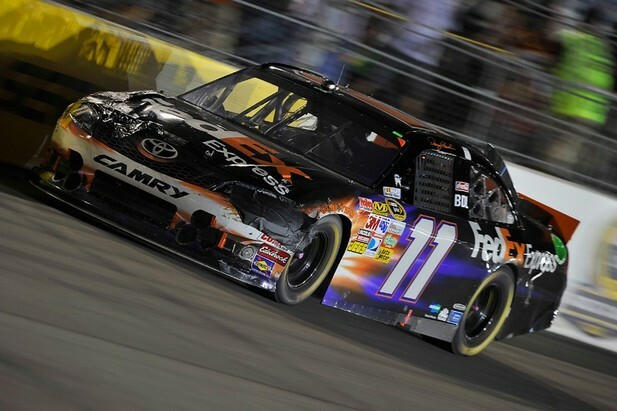 The FedEx Express center in Milpitas, Calif., known for its extensive volunteerism and community involvement, will be recognized with its “RHVA” code letters on the b-post of the #11 FedEx Express Toyota this weekend at Richmond. How can this FedEx team sustain its current momentum heading into the Chase?